This is a powerful statement by our good friend Graca Machel. Graca is the widow of Nelson Mandela, and is a true leader in the fight against poverty, hunger and oppression in Southern Africa. 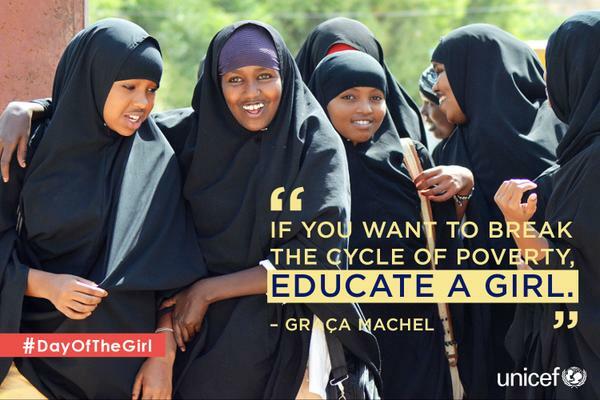 Educating girls and young women is a critical component in breaking the cycle of poverty. Graca is a strong supporter of Stop Hunger Now South Africa, and has organized and participated in several meal packaging events in South Africa and Mozambique. This entry was posted in Hunger & Poverty, Quotes and tagged #DayOfTheGirl, cycle of poverty, education, Graca Machel, hunger, meal packaging events, Mozambique, Nelson Mandela, quotes, South Africa, Stop Hunger Now South Africa, UNICEF, young women on December 17, 2015 by Ray Buchanan. Stop Hunger Now South Africa recently took part in Mandela Day celebrations in a most special fashion, packaging over 800,000 meals for the hungry. An article reprinted from the Stop Hunger Now Newsletter gives the details of this powerful tribute. Stop Hunger Now Southern Africa hosted “Meals in Memory,” a large-scale two-city volunteer meal packaging event to celebrate the ideals of Nelson Mandela on July 18, 2014. Volunteers across South Africa and the world celebrated by taking just 67 minutes out of their day to do a good deed for their community. Meals in Memory saw local celebrities and more than 5,000 volunteers in Johannesburg and Cape Town package 848,681 meals in 67-minute shifts. Graça Machel, widow of the beloved icon who inspired this day of reaching out to those less fortunate, gave the opening address at the Sandton Convention Centre. She then joined enthusiastic volunteers to package 638,826 of the day’s total meals. “Wherever Madiba is today, you can be sure he is smiling,” said Machel. Among the thousands of volunteers who pitched in were Madiba’s great-grandson Luvuyo Mandela and South African rugby star Pierre Spies, as well as Gert-Johan Coetzee, Joelle Kayembe, Benny Masekwameng, Kerry McGregor, Zuraida Jardine, Louise Carver, Chad Saaiman, Jacques Terreblanche, Bonang Matheba, Tamerin Jardine, Tshepo Mogale and Kuli Roberts. At Canal Walk Shopping Centre in Cape Town, 162,432 meals were packaged, with another 18,727 meals tallied at the East Rand Mall; 18,144 meals at Deutsche Bank; and another 15,552 packaged with General Motors . Stop Hunger Now Southern Africa, whose mission is to get nutritional meals to young children at Early Childhood Development Centres that receive no government funding, was thrilled with the results of the meal-packaging drive. Graca Machel gets amped to pack meals during her 67 minutes. This entry was posted in Hunger & Poverty, News & Views, Quotes and tagged Barry Mey, Cape Town, Graca Machel, Mandela Day, Mandiba, meal packaging, Nelson Mandela, Sandton, Stop Hunger Now South Africa, volunteers on September 18, 2014 by Ray Buchanan.